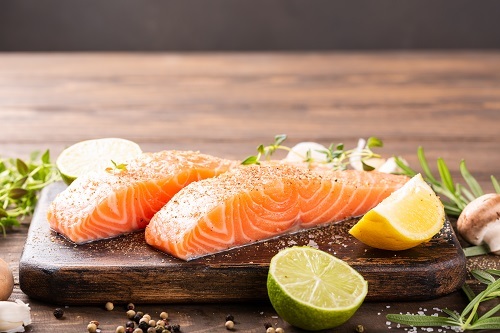 One of the healthier foods you can eat with a hearty flavor is salmon. The benefits of this fish are well-documented, which is fantastic when you can find a recipe that makes it taste even better. The combination of fresh fruit with the rich flavor of Manuka honey will stack this recipe up with anything you will find at a fine dining restaurant. The benefit here, though, is that you don’t have to be a chef to whip it up! All you need is about 30 minutes and some basic cooking utensils, and of course Manuka honey, and you are ready to go! To begin, preheat your oven to 400 degrees Fahrenheit on the Bake setting. Place the salmon filets into a small dish (or a sturdy plastic bag), and then cover them with the raspberry vinaigrette and the orange zest. Let the filets marinate for about 30 minutes. Line a baking sheet with parchment paper and then spray it cooking spray on it before placing four (about a ¼ cup) piles of spinach on the baking sheet for the filets. Top every spinach pile with three or four slices of red onion and a pinch of black pepper and kosher salt. Remove the filets from your marinade and place a filet (skin side facing down) on each spinach pile. Top the salmon with pepper, salt, three slices of red onion, and a slice of orange. Bake the salmon filets until they easily flake with a knife or fork, which should take between 15 and 20 minutes. Note: As a general rule, you should bake fish at 10 minutes per inch of the fish’s thickest part. While the fish is cooking, you can make the blueberry Manuka salsa, which you do by combining all the ingredients in a small bowl until they are well-blended. Add pepper and salt to taste. Remove the filets from your oven and allow them time to rest for five or ten minutes before you serve. Spoon the salsa over the filets, and then serve the salmon and spinach at your discretion. Nutrition Info per Serving: Calories: 210; Fat 7g; Protein: 23g. If you need to order Manuka honey to make this recipe, click here. And, remember, we offer FREE shipping on all orders of $150 or more!